When the German Kriegsmarine launched the battleship Bismarck in February 1939, Nazi propagandists proclaimed her a technical marvel. And while she was a well-built ship, many of her innovations are, like other things that “everybody knows” among history buffs, simple myth. In many ways she was less advanced than American, Japanese, Italian or British battleships of the same time. The old: Imperial battleship Bayern. The new: Nazi battleship Bismarck. Prior to Bismarck and her sister Tirpitz, the last true battleships completed in Germany were the two Bayern-class dreadnoughts built for the Imperial Navy. Baden and Bayern were laid down in December 1913 and January 1914 and completed in 1916; two slightly improved sisters, Sachsen and Württemberg, were laid down in 1914 and 1915 respectively but never completed. German engineers had toyed with an armament very similar to that of the American Pennsylvania class laid down within weeks of Bayern and Baden: Twelve 13.8-inch (350mm) guns in four triple turrets. The American ship carried a dozen 14-inch guns. A German team had inspected the Austrian Viribus Unitus with its four triple turrets and came away unimpressed with Austrian battleship design in general and the triple turret in particular (Austrian engineers on a reciprocal visit had equally scornful comments about the turret arrangements of German dreadnoughts). The middle gun, the Germans believed, would have a markedly lower rate of fire and in case of an unlucky hit to the turret, the ship would lose three guns rather than two. A bigger turret also created a larger opening in the hull, weakening the ship’s structure. When word arrived that the British would go to a 15-inch gun for their new battleships, the German admirals decided to skip the intervening caliber and go from 12-inch to 15-inch guns for their new battleships. Bayern followed the same general layout as the British Queen Elizabeth class laid down about a year earlier: eight 15-inch guns in four twin turrets, two of them forward and two aft, in superfiring pairs (one turret mounted above and behind the other). Bayern had 11 coal-fired and three oil-fired boilers, a mixed power plant first adopted for the Derfflinger class battlecruisers a year earlier. Bayern was the last battleship design actually built by Imperial Germany, though design work continued on a number of projects that could not possibly be built until after the war. Had the Germans laid down a new class of battleship in 1916, it would have been a repeat of the Bayern class. The new designs for the post-Bayern battleship class featured a new 16.5-inch (420mm) gun; like the 13.8-inch gun this was a Skoda design licensed from the Austrian firm. They were much larger than Bayern, and like the Mackensen class battlecruisers featured one large funnel. Internal arrangements — armored citadel, magazines, boiler rooms — were very similar to Bayern. When Reichsmarine enginners began preliminary work on a new class of true battleships in 1932, they picked up where the Imperial staff had left off. Formal contracts for the design, and for 15-inch and 16-inch naval guns, went out in 1934. Germany laid down a pair of battle cruisers in 1934, Scharnhorst and Gneisenau, with 11-inch guns to adhere to the Versailles Treaty limit on German warship armament and thus help bolster German chances in the negotiations that would lead to the Anglo-German Naval Treaty a year later. These two ships were designed so that the triple turrets for 11-inch guns could be replaced by twin turrets holding 15-inch guns at some later date. Baden just after commissioning, 1916. The 15-inch, 47-caliber guns for those turrets were an improvement on the 45-caiber weapons carried by Bayern, borrowing some technical characteristics from the 50-caliber guns built by Ansaldo for the Littorio class in Italy. Despite some fanciful claims by later writers, these guns had no magically fast rate of fire and slightly less range and penetrating power than the Ansaldo gun. Gunnery practice would show that Bismarck had a main battery rate of fire of about two rounds per minute — about standard for all World War II battleships, though many American crews did better. Initially set at 35,000 tons, the new design (“Battleship F,” only later named Bismarck) followed very conservative lines. The engineers drew heavily on Bayern and on the never-built L20 and L28 designs. 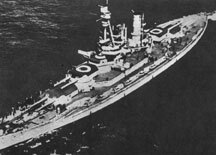 Bismarck shared the armament layout of Bayern; with Bayern, German naval author Siegfried Breyer wrote in 1970, “the battleship as a type had reached its peak of perfection. Any improvements during the subsequent twenty years concerned only details and not the actual design of the type of ship.” The biggest difference in armament came in the secondary battery; where Bayern carried her sixteen 5.9-inch guns in a casemate battery (similar to L20 and L28), Bismarck had a dozen in six twin turrets. Just as the L20 series had an outdated secondary battery (Italian designers were already placing secondary guns in turrets), so did Bismarck. 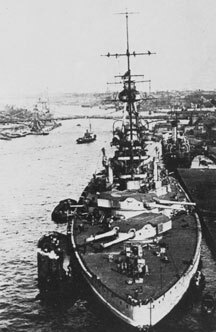 Other navies, especially the Americans, were mounting dual-purpose secondary guns on their new battleships. Germany lacked such a weapon, and design concepts seem to have lagged behind that of other nations as well, and so Bismarck carried two different types of secondary gun — the 5.9-inch battery for surface targets, and sixteen 4.1-inch (105mm) anti-aircraft guns. While L28 carried her 5.9-inch guns in casemates, she did have four turrets for 105mm or 88mm anti-aircraft guns (this detail differs in some sketches), though in single mounts. While there is a superficial resemblance between Bayern and Bismarck, the real similarities are under the skin. Both ships had nearly identical three-shaft machinery layouts. The higher speeds demanded for Bismarck resulted in a much longer ship, both to allow much finer lines and to house a much larger power plant: 138,000 horsepower for Bismarck against 48,000 for Bayern. The dozen huge boilers also resulted in a ship that drank fuel at a prodigious rate; Bismarck had a relatively short radius of action, a flaw shared with the older Imperial designs. Magazine layouts were also nearly identical between the two ships, another sign of heavy borrowing by Bismarck’s designers. Where they differ is in their bridge arrangement, but here also Bismarck’s designers drew on earlier work. Werner Fuchs, the Germany navy’s head of construction, demanded that all heavy ships share a similar appearance, thinking this would confuse enemy spotters. Features included a heavy foremast for the fire control director and a single large funnel. 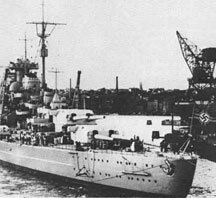 Bismarck’s upper works, like that of Scharnhorst and the Admiral Hipper class cruisers, was based not on Bayern but on L28. Bismarck and Bayern also shared strong internal protection, and were well-built ships (though British engineers had been rather scornful of the Bayern class in post-war testing). Their armor schemes were very similar, with Bismarck sporting thicker deck armor but a thinner armored belt than Bayern. Bismarck crept well over the 35,000-ton figure, but by the time she launched the “accelerator clause” of the London Naval Treaty had kicked in and the upper limit had gone to 45,000 tons. Though Bismarck and her sister were the largest battleships ever completed in a European shipyard, they were within the limits set by international agreements and much smaller than the huge Japanese Yamato class or even the American Iowa class. Bayern and her sisters appear in Great War at Sea: Jutland. Bismarck of course is the centerpiece of the game bearing her name. Click here to order Great War at Sea: Jutland now! Click here to order Second World War at Sea: Bismarck now!